While we love the idea of kitting out our homes in designer furniture, some of us still have the tiny issue of needing to pay rent and are therefore not necessarily able to budget for high-end pieces just yet. Enter: mid-range furniture. What maketh the mid-range furniture company? We’re looking at brands priced somewhere between big-box retailers and high-end designers. These are companies that operate on a comparatively smaller scale, oftentimes with an actual designer at the helm of each design, and offer a tighter selection of products. Because, while we love brands like Anthropologie, West Elm, and CB2 for on-trend furniture that’s (generally) reasonably priced, it’s time to give the more under-the-radar companies some love too. Read on for the companies to check out if you’re looking for slightly more elevated, long-lasting pieces for your living space that won’t wreak havoc on your bank account. The Copenhagen-based purveyor of Scandinavian-inspired furniture and home decor combines streamlined shapes with a refreshing palette built around tertiary hues. Everyday staples are reimagined and boring household essentials are given a new lease on life with vibrant color revamps and effortlessly cool builds. In November, HAY announced the opening of their first US-based brick-and-mortar—along with the launch of a new online platform dedicated solely to their North American shoppers—giving accessibility a whole new meaning. If it’s simple, modern furniture you’re after, Blu Dot is for you. The Minneapolis-based company started in 1997, so they have more than a decade of experience creating well-made, affordable pieces for every room of your house. Several of their best-selling sofas go for less than $2,000, and many pieces, including ottomans, accent chairs, lamps, and pillows start at less then $200. 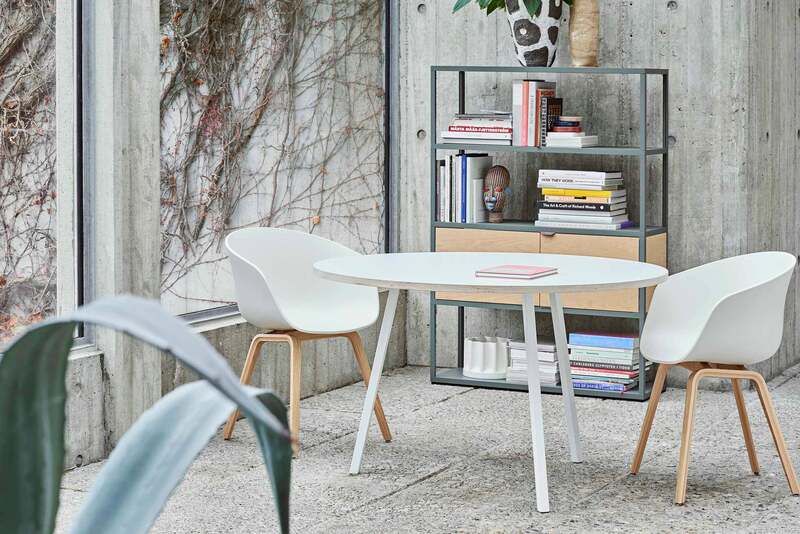 Consider Hem the perfect upgrade after Ikea: Based in Stockholm, the furniture studio will still bring you the Scandi simplicity you’ve come to know and love, but with a much more elevated aesthetic. Hem works directly with designers to create fun, functional pieces like the nearly iconic adaptable pouf sofa (it can grow with you), a rotating pedestal shelf, and colorful pendant lamps. This direct to consumer brand launched in August 2015, and is remarkable for its tightly curated selection of products. By “tightly curated” we mean that Campaign currently offers only three items—a chair, a loveseat, and a sofa—and while the company is releasing a slew of new products, there’s something to be said for the quality that results from specialized production. Each piece is simple yet beautifully crafted, and made-to-order to ensure attention to detail. Campaign also offers removable covers and a lifetime guarantee on the frames, meaning that every item is built to withstand wear and tear. Plus: They also carry four different sizes of throw pillows that come in 45 different designs. Detroit-based Floyd is another specialized furniture company, offering only a bed frame and a table that are succinctly dubbed “The Bed” and “The Table”. The company was founded to tackle the problem of disposable furniture, and encourages consumers to shop smartly by investing in quality items in timeless silhouettes that fit right in with any decor aesthetic, even as tastes change. Both pieces are easy to assemble—they don’t even require tools. Forget the usual sources of inspiration—the idea for Article came about after its founders took a trip to the Arctic Circle (seriously). Following that slightly unconventional conception story, it’s no surprise that the company itself seeks to disrupt the furniture industry, and is doing so by cutting out the middleman and streamlining production costs. Larger items ship for a flat fee of $49 and are super easy to assemble at home. In terms of style, Article’s products are unwaveringly minimalist, no doubt inspired by the initial trip that created the company. #Antarcticachic? Part of the reason why we love Capsule Home is because they have a line of sofas explicitly designed for small spaces that are actually affordable at $399. The three styles even have USB ports hidden within for easy cell phone charging. Beyond those options, the LA-based design studio offers tons of options for furniture, working with a roster of in-house designers for thoughtful, fashion-inspired pieces. Update your living room with plush armchairs and sleek side tables that won’t cost a fortune. Quality is truly at the forefront with Sixpenny, which emphasizes its use of only real materials like down feathers and solid wood in constructing their products. Everything ships pre-assembled, so if DIY is not your thing this could be the furniture company for you. Focusing on living and dining pieces, the selection is varied but not overwhelming; though if you do want to narrow down your search, check out the “Shops” section. This is where Sixpenny breaks down its catalogue into three distinct styles, so you can shop according to your personal aesthetic and save time whilst finding the perfect sectioal. Burrow is another company keeping it sweet and simple. With only three products to choose from, consistent quality is easy to ensure. The sofa, ottoman, and sectional are all made from environmentally-friendly materials (including sustainably-sourced wood and recyclable packaging). Plus, in addition to the responsible design, every piece is made to last: The fabric is stain-resistant, and includes a hidden USB charger. Every Burrow item ships directly to you, and the range of colors and sizes available for each product makes customization easy. This story was originally published January 26, 2018. It has been updated with new information.